Leh, February 8, (Scoop News)-On granting Divisional status for Ladakh region, the Chairman & Chief Executive Councilor, LAHDC, Leh Jamyang Tsering Namgyal on behalf of the people of Ladakh region and Ladakh Autonomous Hill Development Council, Leh extended heartfelt gratitude to the NDA Government headed by the Prime Minister of India Shri Narendra Modi, Governor J&K State, Shri Satya Pal Malik, MLC Leh, Shri Chering Dorjey, the Advisors to Governor, Chief Secretary, J&K, BVR Subrahmanyam and Shri Thupstan Chhewang, former PM Ladakh. 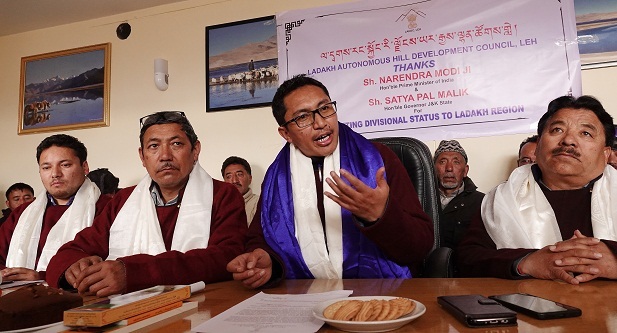 Addressing a press conference here this afternoon at Council Secretariat, Jamyang Tsering Namgyal termed the grant of divisional status for Ladakh as a big boon as well as a historic step towards fulfillment of developmental and political aspirations of the people of Ladakh. He said that this demand has been persistently raised especially since last three months under the present Council, adding that according divisional status today would ensure financial as well as administrative autonomy for this region. JTN further said that Ladakh would witness an added momentum in every field of development in the coming days besides the Govt. officials working under divisional cadre would also immensely benefit out of it. CEC further underlined that grant of divisional status for Ladakh signifies the caring intent of Modi Government and said that this is a grand step forward towards Union Territory status. Jamyang Tsering Namgyal on behalf of the LAHDC and Council members greeted the people of Ladakh on this historic achievement. The press conference was also attended by the Deputy Chairman, LAHDC, Leh Gyal P Wangyal, Executive Councilors, Tsering Sandup, Mumtaz Hussain, Phuntsog Stanzin, BJP Councilors, BJP District President, Dorjey Wangchuk and BJP party workers. It may be mentioned that Jammu and Kashmir Government has approved creation of a separate Administrative/ Revenue Division for Ladakh. This division will comprise Leh and Kargil Districts with its headquarters at Leh. Ladakh is one of the most sparsely populated regions in Jammu and Kashmir and is the highest plateau in the State of Jammu & Kashmir, with most of it being over 9,800 feet above sea level. Ladakh region is geographically isolated with a sparse population and inhospitable terrain which remains landlocked for nearly six months in a year. Consequently, the Region is riddled with insurmountable problems with respect to delivery of developmental schemes, redressal of public grievances, conduct of administrative affairs and governance as such. The people of Ladakh have, for a long time, been demanding effective local institutional arrangements which can help promote and accelerate the pace of development and equitable all-round growth and development having regard to its peculiar geo-climatic and topographic conditions, stimulate and seek fullest participation of the local community in the decision-making process. At present the powers of local governance have already been decentralized by formation of Hill Development Councils for the Leh and Kargil Districts. This was given effect to by enacting the Jammu and Kashmir Ladakh Autonomous Hill Development Council Act, 1997. Under the said Act, the Hill Development Councils were established both for Leh and Kargil Districts. In order to strengthen the respective Hill Development Councils Leh and Kargil, the LAHDC Act, 1997 has been amended further in 2018 to give them more powers. During winter months the entire Ladakh region, comprising both Leh and Kargil, remain cut-off from rest of the country for almost six months and air travel via Leh is the only mode of transport available to this region, which makes it impossible for people to visit other parts of the country for various purposes. The remoteness and inaccessibility of the area makes the area eligible for establishing a separate Division for the said region. Taking all these into consideration, the Government has decided to create a separate Administrative/Revenue Division for Ladakh. A Divisional Commissioner and Inspector General of Police for Ladakh Division will be appointed shortly. The Committee under Principal Secretary (Planning) will finalize all other details on posts, staffing, roles, responsibilities and location of offices. This decision of the Government goes a long way in fulfilling the governance and development aspirations of the people of Ladakh region.